When speaking of these two Louisiana artists, one needs to know that music was always their first career choice. Warren (aka Warren Schexnayder) began his career at the age of 12, and Willie Tee (aka Wilven Trahan) at the age of 13. Although Willie was aware of Warren Storm, the two had not actually met until one night when they were both scheduled to play at the same club in different bands. An immediate friendship was formed and these two became as close as two brothers. Over the years they played along side each other, and in 1980 along with a friend, James Stelly, decided to form their own group, The Cypress Band. Over the next four years, booking jobs was difficult when the oil boom fizzled out, causing the band to split up. Warren & Willie Tee continued to pursue individual careers, sometimes with each other in the same band as guests or working on their own with other bands. In 2004, because of popular demand, Warren & Willie decided to revive the Cypress band. 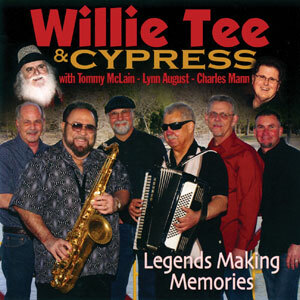 In 2012, Warren left the group and “Warren Storm, Willie Tee & Cypress” became “Willie Tee & Cypress.” Their latest release, Legends Making Memories, includes Willie Tee, Karl Bordelon, Tommy Richard, Scott Broussard & Carl Dugas with guest musicians Tommy McLain, Lynn August & Charles Mann. Having Warren Storm and Willie Tee stock a SWAMP POP JUKEBOX is like asking Frost and Dickinson to pen a pad of poems: The job can be perfected a thousand times over. Such expertise comes from the two legendary singers learning their game back in the ’50s and having never left the swamp since. Tasty cover material sniffed out from far and wide gets just as passionately devoured as ever. So Merle Haggard’s “Wake Up” and Fats Domino’s “What’s the Reason I’m Not Pleasing You” are just as much fair game as are “I’ll Try One More Time” from Louisiana rockabilly king Johnny Janot or “Don’t Give Up on Me” by today’s Cajun Burt Bacharach, Ivy Dugas. Since the tastiest songs seem to be those with bittersweet cores, Rhonda Vincent’s self-lacerating “Teardrops Over You” is the first on the list to be given the full Cypress treatment. That typically entails the veteran band tailoring more syrupy tempos with nicely rounded melodic corners to put the smoother Storm and rougher Tee so at ease to croon away the day, laying their hearts on the line for a Bobby Charles or King Karl tune. Plus, Tee loves to blow dollops of his hallmark saxophone under those same conditions. But blink and you’ll miss the set’s real unsung heroics. Midway through the bopping “Look at Her,” guitarist Tommy Richard daringly hurls an amazing 16-second fireball that reminds us that lightning very much can strike out of nowhere in Warren n’ Willie’s Cypress swamp. Cypress (named after the type of water resistant trees proliferating in the surrounding Atchafalaya Swamp) has been a long running Lafayette, LA, act with several incarnations since its inception in 1980. Despite undergoing many turnovers in personnel over the intervening years, Cypress from the outset has always been led by two figures, actually local legends – drummer Warren Storm, 77, and saxophonist Willis Tee (Wilven Trahan), 70. Both of these seasoned veterans had between them enjoyed well over a century in the entertainment business. Storm’s (who just parted ways with the all star aggregate, Lil’ Band o O’ Gold) major claim to fame has been in his capacity as a member of J.D. Miller’s famed studio band (Lazy Lester, Katie Webster, Al Foreman, etc) in nearby Crowley, which backed up many of the renowned Excello blues artists of the 50s and 60s. During that era, he also visited the national pop charts with “Prisoner’s Song” in 1958. Tee’s professional (and recording) career started in the early 60s as member of hot area R&B ensembles such as Kenny (Thibodeaux) and the Jokers and The Rhythm Masters. Since then, their paths have crossed as session players or in a myriad of outfits of almost every musical persuasion. In fact, they know each other so well, that they can almost complete each other’s sentences. Cypress has become a much beloved institution in the territory, since it can, chameleon-like, deliver whatever the audience demands, be it blues, C&W, rock and roll, Cajun or Swamp Pop, the latter indigenous genre of music which incorporates the inherent melancholia of Cajun with what Dr. John (Mac Rebenack) has christened the classic South Louisiana two-chord, E flat B flat.” Such as this group’s popularity that it plays to packed houses, especially at casinos in Kinder and Marksville and it’s been invited to New Orleans’ prestigious JazzFest so many times in recent memory that it can be considered a fixture there. SWAMP POP JUKEBOX, released on Floyd Soileau’s Jin records of Ville Platte is the group’s third album on this imprint since 2004 (when it reformed after a long hiatus) wherein both Storm and Tee handle the vocal chores. But its heading is actually a misnomer. Instead of a dozen of so expected “covers” of standards as its title suggests, half of this collection is totally fresh material with three cuts penned by native, Ivy Dugas; whereas bluegrass chanteuse, Rhonda Vincent, contributes the heartfelt, C&W flavored opening track, “Teardrops Over You.” Another original is bassist Steve Grisaffe’s (formerly of group, River Road) blues shuffl, “Strong Enough to Leave You.” In fact, to its credit, aside from Little Richard’s rollicking “Lucille,” all of these selections are seldom heard, including Bobby Charles’ “Big Boys Cry,” Merle Haggard’s “Wake Up,” Fats Domino’s “What the Reason I’m Not Pleasing You,” and three equally obscure “Swamp Pop” nuggets. Like a pot of their regional cuisine, gumbo, there are enough ingredients in SWAMP POP JUKEBOX to please anyone’s discriminating palate. “I could have used studio musicians but I wanted people to hear the real thing – what we sound like during our stage show,” said Warren. But he has never had to apologize for any of his hand-picked supporting casts, which includes stellar guitarist, Tommy Richard, who has distinguished himself for many years backing zydeco accordionist and Black Top artist, Lynn August. And the whole package is lovingly recorded in Ville Platte by another outstanding bassist, Scott Ardoin, who doubles as producer. So pick up a copy of SWAMP POP JUKEBOX and you might be pleasantly surprised to discover that these two septuagenarians still can really swing. No rocking chairs yet for these young at heart rockers. Far from it. Swamp pop continues to be the red-headed stepchild of Louisiana music. Just take a peek at LouisianaSoundtrack.com, a new, Louisiana Office of Tourism site highlighting our state’s great music. There’s lots of great stuff there, including a home page with links to pages about jazz, blues, Cajun, zydeco and country. But there’s no link for swamp pop, a blend of Cajun and Creole music, New Orleans R&B and country born in the 1950s and ’60s. Swamp pop has far outsold its south Louisiana cousins, Cajun music and zydeco, with more than 20 songs making the Billboard Hot 100 in the ’50s and ’60s. Hits include Barbara Lynn’s “You’ll Lose a Good Thing,” later covered by the Rolling Stones, and Phil Phillip’s “Sea of Love,” which has been redone by more than two dozen artists in the United States, Europe and Australia. Swamp pop still has a large, loyal following, especially in southeast Louisiana. Yet it is rarely featured at Louisiana’s numerous festivals and events. Several music veterans are making a stand for swamp pop in a new CD, Legends Making Memories, by Willie Tee and Cypress with special guests Tommy McLain, Charles Mann and Lynn August. The disc is out on JIN Records, where many of those swamp pop national hits were recorded, in Ville Platte, the Swamp Pop Capital of the World. Legends is not strictly swamp pop. The 16-song CD also includes country, Cajun and zydeco, surrounded by a rich horn section, keyboards, piano accordion and veteran vocalists who still got it. Each has spent 50-plus years in front of the mic. Sax man Willie Tee, aka Lafayette native Willie Trahan, has been performing professionally since 1958. He formed Cypress in 1980 with Warren Storm, an Abbeville native whose “Prisoner’s Song” went national in 1958. McLain was part of the hit parade with “Sweet Dreams,” a Top 15 hit in 1966. Mann never made the national charts, but his “Red, Red Wine” and “Keep You Arms Around Me” remain swamp pop standards. August, another Hub City native, has decades of zydeco, blues and R&B experience, including time as a drummer for Esquerita, who influenced rock ‘n’ roll pioneer Little Richard. McLain may make the biggest noise on the CD with a fine version of “Houston Solution,” Ronnie Milsap’s famed cry-in-your-beer number from 1989. The variety on the Legends CD is like radio when these musicians were climbing the charts. Everybody gets a little something — all one on station. For these two Louisiana artists this disc is a long time coming, however for us it is well worth the wait, or for those that don’t know of these two, it is a disc that can infuse the heart with great joy. Willie “Tee,” Trahan wrote a number of songs that became popular regionally, and his work on sax made him an in demand musician in the Lafayette, LA area. Warren Storm grew-up out in Abbeville, LA, his father was a Cajun musician. As a kid he ran around with the legendary songwriter (See You Later Alligator) Bobby Charles, often going (sneaking) into New Orleans to listen to the black Rhythm & Blues Artists. He was a drummer and singer with the Shondells, and later with among others Lil’ Band of Gold, with Steve Riley and C.C. Adcock. He is known as one of the most expressive and distinctive voices of swamp pop music. Warren Storm and Willie Tee met in the 80s and put together the Cypress Band and played clubs for years until the oil boom fizzled and the clubs closed. Recently the two joined forces again and reformed the band Cypress and we are blessed with their work. For this disc they carefully chose songs they loved, giving great renditions of three Bobby Charles songs, four Fats Domino/ Dave Bartholomew songs and seven more from various others that they do a righteous job with. They split the lead singing chores right down the middle. The band is solid behind them and the songs fit these two well; “(There Is) Something on Your Mind,” the Big Jay McNeely classic, and “Sea of Love” just stand out. But there is not a weak or throwaway cut on this disc and I had a hard time removing it from the changer. You may have to search but don’t let it slip away. This CD is a good example of why I hate to write reviews. How can I possibly encapsulate over a century of musical exploits between two larger than life figures of South Louisiana who teamed up to make this album? When I first met the duo in 1980 in Lafayette, they had just formed the band Cypress, a hard working outfit specializing in R&B, Swamp Pop, and oldies. But it was like joining a play “in medias res,” because so much of their illustrious careers were already behind them and they were seasoned veterans trying yet another experiment. Even then they brought so much to the table and now even more so as far as experience and compatibility go. Suffice it to say that both had long since distinguished themselves as session musicians – Willie Tee (Trahan) as saxophonist and Warren, particularly as percussionist for J.D. Miller’s famed studio band nearby Crowley, LA. In 1958, Warren scored a Top 100 U.S. hit with “Prisoner’s Song” on Nasco, and Willie by the early 60s had a hand in several local favorites authored by Kenny Tibbs (Thibodeaux) & the Jokers on Viking records. And folks, this was not even the beginning for these players, who both made their professional debuts as pre-adolescents. Anyway, over the years the fortunes of Cypress were tied directly to those of the oil industry and as you might suspect, there were lean times which led to the dissolution of the group, as well as several incarnations of the group when the economic climate was more propitious. This CD represents the 2004 and latest installment “back by popular demand” and features ex-Lynn August guitarist of note, Tommy Richard, and bassist Gerald Romero, who has been a fixture in Yesterday’s Band, yet another permutation in the saga of Warren and Willie partnerships. Produced by historic record man Floyd Soileau of Jin records, who just turned 70, and expertly engineered by David Rachou at his state of the art facilities of La Louisianne in Lafayette, it is not only another feather in the cap of both of these living legends but also it proves, along with the recent releases of other icons of this genre of music, Johnnie Allan (Memories) and Bobby Charles (Homemade Songs), that Swamp Pop is still very alive and well in South Louisiana. A few years ago, long-time Louisiana musical icons Warren Storm and Willie Tee decided to revive their legendary Cypress Band, a group that they had first formed in 1980. The duo found that modern audiences were enthusiastic in their support, and soon began building quite a following in area nightspots. Deciding that their mix of swamp pop and R&B might have wider appeal, they’ve now generated a new album on the Jin Records label, simply titled Warren Storm, Willie Tee and Cypress. Both performers are veterans of the Southern Louisiana musical scene, with a high comfort factor is just about every kind of music popular to the area, and they’ve chosen a diversified mix for their album. The two stars split the lead vocal duties on the fourteen tracks, and Willie also provides some fine and funky sax play on several pieces. You’ll find a little bit of everything here, but one influence is immediately obvious — Fats Domino. Several of the R&B legend’s songs are included, and Willie takes on the difficult job of emulating Fats. He’s mostly pretty successful, with his best efforts probably coming on “My Girl Josephine,” and the slow ballad, “Valley of Tears.” Less enjoyable is his try at “Rosemary,” which begins with his piercing honkin’ sax take. Along with the Domino songs, there are some other tracks featuring ‘oldies’ performed by the guys in their distinctive style. The classic song “Shake, Rattle and Roll” is performed pretty straight, but their take on “Sea of Love” is a hoot. An album from the swamps wouldn’t be complete without some good old Cajun-style music, and “Chicken on the Run” does it up right. There’s also a taste of Louisiana style country music, with “Tennessee Blues,” and “I Don’t Want to Know,” both featuring Warren’s strong vocals. A nice and varied collection, encompassing several different types of music but all performed in the style of a couple of Louisiana legends.